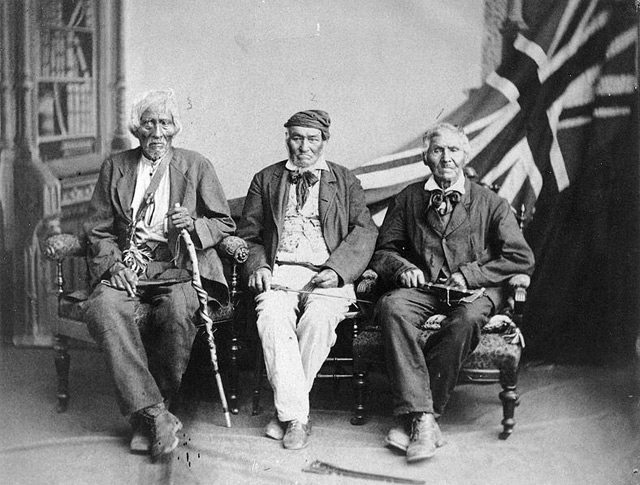 Three of the last surviving Six Nations members who fought in the War of 1812, photographed in Brantford in 1882. Left to right: John “Smoke” Johnson, John Tutela, and Young Warner. Library and Archives Canada, C-085127, via Wikimedia Commons. While no one agrees on who won the War of 1812, there tends to be consensus among experts regarding the loser: aboriginals on both sides of the border. Any power they held during the conflict was lost soon after, as they were shunted onto reserves or forced to move further west. Yet the complexities of the natives’ war experience left positive and negative consequences which linger into the present. Hill chairs the Six Nations Legacy Consortium. It’s a group, formed in anticipation of the war celebrations, that is dedicated to ensuring his community’s historical perspectives enter the public discourse. Prior to the War of 1812, the American Revolution had scattered the Six Nations. Some members lived in upstate New York, while others had accepted a British offer to move west to a tract of land along the Grand River. In 1812, as war loomed once again, appeals to Six Nations members to support either of the main combatants led to calls for neutrality. This was followed by inter-tribal warfare as natives lined up behind the Americans or British, depending on who they felt would best look after their long-term interests or crush them the least. In Hill’s case, his paternal Mohawk ancestors from Grand River battled his maternal Tuscarora ancestors from New York. When the war ended, the Six Nations used what Hill calls “old cultural protocols” to broker peace among themselves. Hill finds it significant that there have been no internal wars since that time. 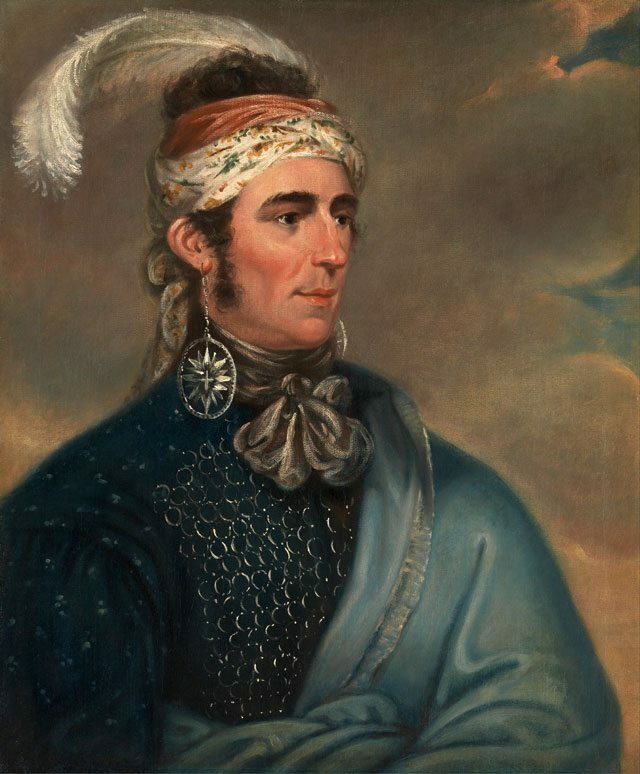 Portrait of Major John Norton as Mohawk Chief Teyoninhokarawen, circa 1805, by Mather Brown. Yale Center for British Art, via Wikimedia Commons. When it comes to natives involved in the war, the public usually thinks of Tecumseh, whose Shawnee nation had uneasy relations with the Six Nations. In a lecture this Wednesday night on the role of the Six Nations in the conflict, Hill will spotlight lesser-known figures. “One of the problems with history,” Hill observes, is “it focuses on just a few individuals. There were countless other people who didn’t participate in the war, but were then part of the making of peace.” In an appearance on the Agenda last year, Hill noted that it’s easy to herald a fallen leader like Tecumseh, less so the nameless people who fought hard and worked to create a peace settlement which allowed their nation to survive. While some Six Nations figures like John Norton and John “Smoke” Johnson gained attention through their leadership skills, others are known only through oral histories or surviving council records from the early 19th century. In the Battle of York, which celebrates its bicentenary next week, the Six Nations didn’t play a direct role. Three hundred warriors were ready to participate, but were held at bay by the British. When they heard the grand ammunition magazine explode, they assumed the Americans would hit Burlington Bay next and prepared themselves for a strike that didn’t happen. During the actual battle, an advance group of approximately 50 Chippawa, Mississauga, and Ojibwa warriors commanded by Major James Givins was sent to meet the first wave of American invaders west of Fort York. The warriors were outnumbered, which led to, as historian Robert Malcolmson put it, “a murderous game of hide and seek among the trees, and as the minutes went by, the warriors’ resolve slackened and then dissolved.” Up to eight warriors were killed. The only name recorded among the fatalities was Yellowhead, who is said to have been buried along Yonge Street. The rest joined the mass of nameless native casualties during the conflict. Additional material from The Iroquois in War of 1812 by Carl Benn (Toronto: University of Toronto Press, 1998) and Capital in Flames by Robert Malcolmson (Montreal: Robin Brass Studio, 2008).